The first IFSC competition of the year had stacked fields on the both the women’s and men’s sides. Ondra sits comfortably in the hand jam on M4. Photo: Vladek Zumr. 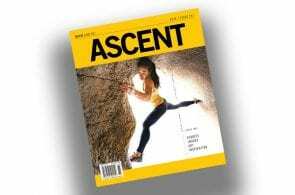 A new wall, custom holds and hand jams—this past weekend marked the first IFSC competition of the year, and it brought with it the expected and unexpected both. 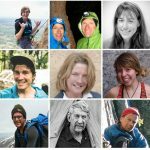 Over 200 athletes gathered in Meiringen, Switzerland for the first of six bouldering World Cups leading up to the Championships in August. Athletes had came ready to test their fitness for this Pre-Olympic season. Familiar faces like Kai Harada, Jan Hojer and Sean McColl didn’t quite make the cut for semis, demonstrating the depth of the field. Last year’s overall winner Jernej Kruder moved on to semis, but didn’t make it into finals. Nathaniel Coleman, the only American to qualify for semifinals in the men’s bracket–in first place no less– also missed the cut for finals. The Japanese team had the best showing, with four men–Tomoa Narasaki, Rei Sugimoto, Fuji Kokoro, and Tomoaki Takata– placing in the top six. 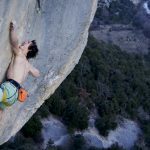 Adam Ondra and Jongwon Chon secured the other two spots. 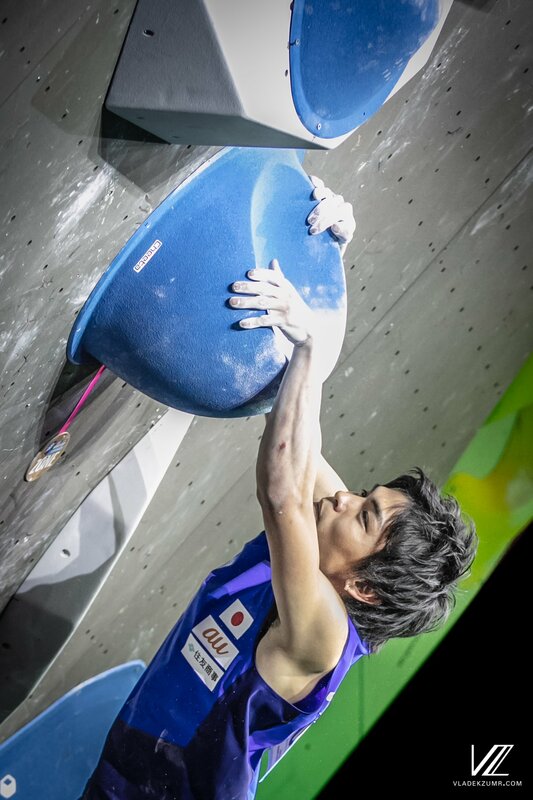 The first men’s boulder was topped by all finalists except Kokoro Fuji. The second left Chon as well as Takata grounded, while the other competitors all topped it, though all required at least three attempts. 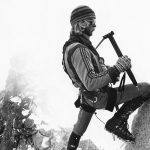 The third boulder further separated the field, after Narasaki and Ondra were the only athletes to top. 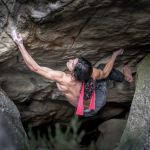 Before the fourth boulder, Narasaki had the lead with two fewer attempts than Ondra. 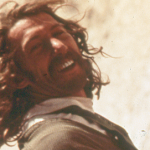 The fourth boulder featured a series of volumes that formed a crack system for jamming the hands and feet before stabbing out to the bonus hold and then the top. All finalists except Ondra were completely stumped by the hand jam sequence. Only Chon could get through the sequence without hand jamming, opting for a dyno to the bonus hold instead, but he slipped before securing the finish. 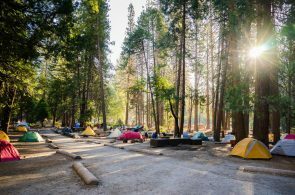 Ondra, who famously honed his crack climbing skills in Yosemite (earlier this year he nearly onsighted the Salathe Wall), flashed the boulder to earn his spot on top of the podium. Narasaki took second and Sugimoto third. Narasaki on Men’s Boulder #2. Photo: Vladek Zumr. The women’s field was equally stacked. The Americans Alex Johnson and Kyra Condie both made it into semifinals, but missed finals by one and two spots, respectively. Akiyo Noguchi, of Japan, and Janja Garnbret, of Slovenia, were tied for first going into finals and French climber Fanny Gibert followed in third. 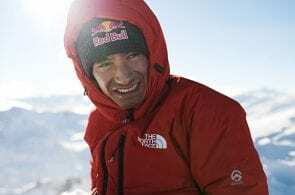 Noguchi and the British climber Shauna Coxsey were the only climbers to top the first boulder, but also the only climbers not to top the second. The third boulder put Garnbret, Coxsey and Noguchi in the lead with three tops apiece. 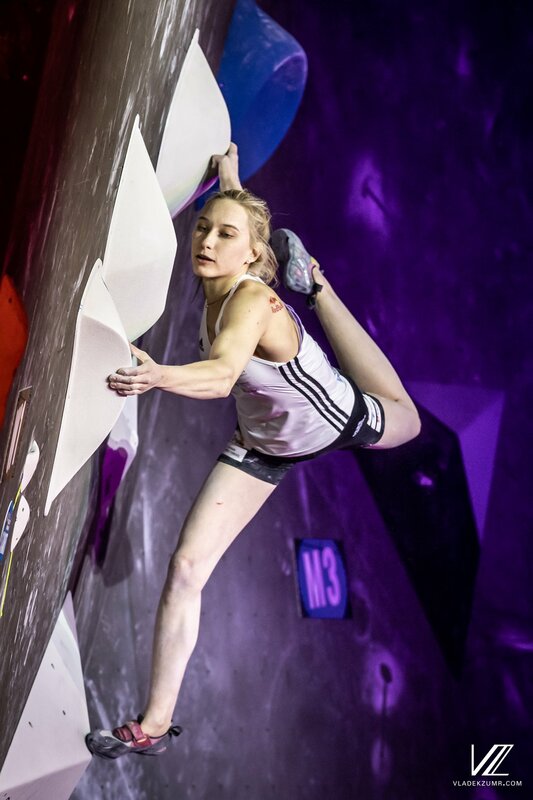 Petra Klingler, the only Swiss athlete to make it into finals and the home-crowd favorite, was unsuccessful on third boulder, placing her in the bottom two alongside Oceania Mackenzie. Mackenzie, a 16-year-old climber from Australia, was the youngest competitor in the finals round and separated from the oldest finalist, Noguchi, by thirteen years. Garnbret stays tight on Women’s Boulder #1. Photo: Vladek Zumr. 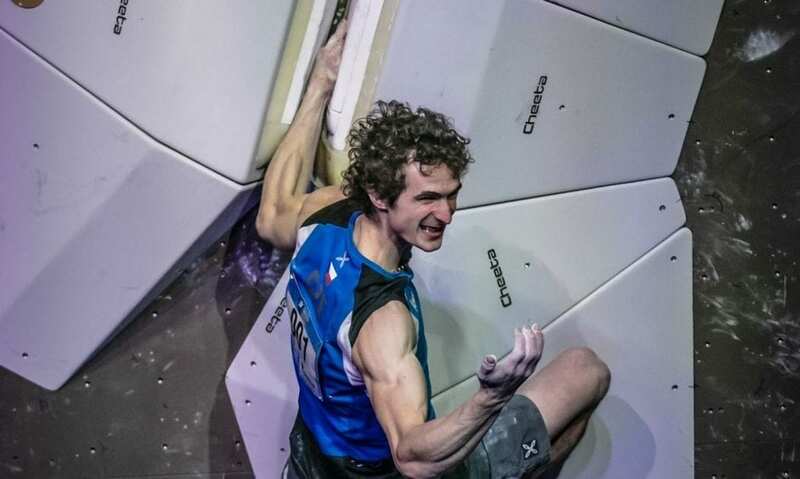 Garnbret and Noguchi were the only finalists to top the fourth boulder. Garnbret secured her twentieth gold with three fewer attempts than Noguchi. Coxsey, despite recent injuries, earned bronze. The complete results, along with replays and pictures can be found on IFSC. Watch the full replay of Finals here!